Help Fund Eliza Dushku's Untitled "Albania" Documentary. Kickstarter is such a fantastic idea. I actually first heard of it when Tom Lenk successfully funded his film "Who Do I Think I Am?" last year. Fast forward to today, Eliza Dushku's own Kickstarter Campaign is only 43% funded so far with only 12 days to go! She's looking for backers for a film that her and her brother Nate are making which is pretty much a love letter to their native Albania. The 20 hours of footage they already shot looks lovely and inspired. The incentives are pretty cool too! You can see the film for a mere $10, but for $40 you can get a Dushku Family Recipe for "Byrek" (a savory pastry using phyllo dough) signed by Eliza along with the DVD and Advanced Online Screening! And if you really want to support the hell out of this project and have $4000 lying around, you can star in a music video alongside Miss Eliza Dushku herself! Today is the 48th birthday of the dude who's responsible for all this! In honor of Joss on the anniversary of his birth, why not gather your friends and have a Buffyfest with a birthday theme tonight? It was actually @notmikestark's suggestion to visit Buffy Wiki, which has compiled a comprehensive list here of all the Buffy and Angel birthday eps. Below are some of my faves and if the official Buffyfest gang was all together today, these are the ones I'd vote for...but definitely visit that link to make your own choices. "Birthday" (Angel Season 3) - It's Cordy's 21st birthday celebration at the Hyperion Hotel and to celebrate Cordelia experiences a vision so painful that she is rendered unconscious! Fun! That's when the awesome sitcom adventure begins and ends with Cordy becoming a half-demon. This is actually one of my favorite Angel episodes. "A New Man" (Buffy Season 4) - Now it's Giles turn to become a demon. One of Buffy's birthdays are foiled again as Ethan Rayne returns to town on and transforms Giles into a Fyarl demon. Strangely, Spike is the only one who can help so the wackiness ensues. LOVE this ep. No I didn't choose "Surprise" or any other because this is Joss's Birthday, a time to celebrate not be depressed! And I'm already down enough over that Firefly Panel announcement. Oh and don't get lost over at Buffy Wiki, you could literally spend hours over at that site. FIREFLY 10th Anniversary Panel at SDCC Aghh! 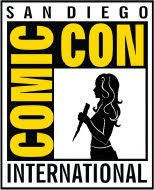 That's the sound of our hearts breaking as we're not attending this geek mecca this year and it's just been announced that there will be a Firefly panel in honor of it's 10th anniversaryat San Diego Comic Con 2012. Of course there will be! Damn. Tim Minear heavily suggested this via his Facebook duing a convo with a bunch of well-known Whedonites, so this rumor has pretty much been branded as true. 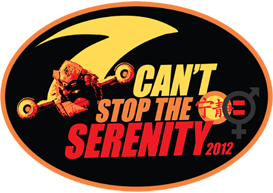 9 'Can't Stop The Serenity' Events this Weekend! It's that time of year again! 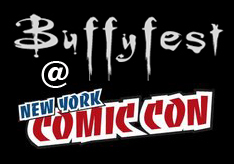 This weekend Can't Stop The Serenity - the amazing, annual fan-fueled effort to support Joss Whedon's favorite charity Equality Now and protect the rights of women around the world - kicks off a total of 9 fun-filled partays this weekend! Some are showing Doc Horrible, some are dinners, some are auctioning off fantastic Whedoney wares and of course all are screening the now classic conclusion to Firefly, the big damn movie: Serenity. 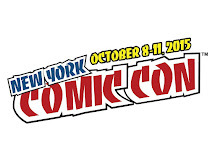 Check the schedule here to see if there's an upcoming event in your neck of the woods! The Whedonverse's Royal Family Tree has Grown! Waaay back on May 23rd Alyson Hannigan finally gave birth and kept it hidden from the world until recently! It's of course the second daughter for her and hubby Alexis Denisof and what did they name 3 year old Satyana's new little sis? Keeva Jane. Which isn't that unlike a fancy nickname for an exotic coffee or....ahem...a certain wacky tabaccy if you know what I'm sayin'. But I love it! Keeva is actually Gaelic word for "gentleness and beauty." Saty and Keeva are the true princesses of our Royal Family and soon they're going to be getting into all kinds of trubbs together, I'm sure. 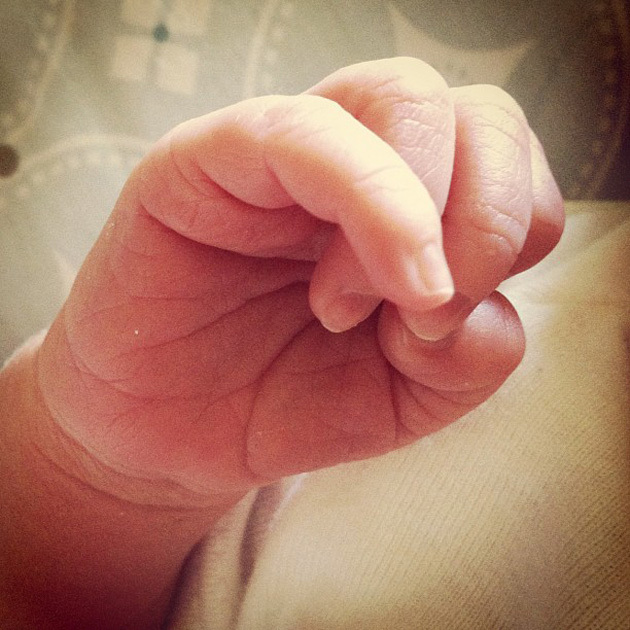 Aly has yet to release a photo of the new bundle to the public, can't blame her there, but she did tease via Instagram this adorable photo of Keeva's hand. Come on! So tiny and cute! 'Angel & Faith' Event at TFAW with Writer Christos Gage Next Week! 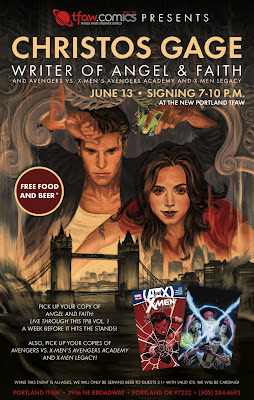 If you're in the Portland area -aka the land of Dark Horse- Angel & Faith writer Christos Gage is signing at the new Portland TFAW June 13 from 7 to 10 p.m. Meet one of comics' coolest writers and enjoy free food and beer (21+ with valid ID). Plus, thanks to publisher Dark Horse Comics, you'll be able to purchase your copy of Angel & Faith: Live Through This TPB Vol. 1 a full week before it hits the stands! In addition to Angel & Faith, Gage has been knee-deep in Marvel's epic crossover event, Avengers vs. X-Men, writing both Avengers Academy and X-Men Legacy. Pick up the most recent issues and get them signed! * They're getting copies of Angel & Faith: Live Through This Vol. 1 a week before release date!